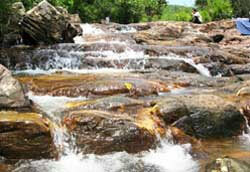 Dau Tieng Lake is located in Phuoc Minh Commune, 20km from the provincial centre. 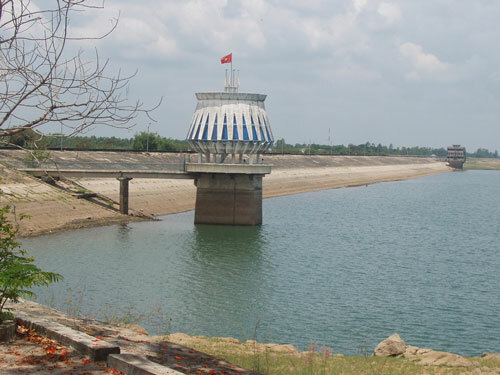 It is famous firstly because it is the largest man-made irrigation reservoir in Viet Nam and secondly, it has an awesome landscape of mountains and mysterious islets. The beautiful lake provides clean water and fresh air that most of us can feel relaxed. Cau Mountain dominates the landscape, covered in a thick primeval forest. Scattered across the lake are a number of islets and the green banks offer inviting camping and fishing spots. Cau Mount is 198m high and boasts diverse flora and 1,600ha of protected forest. At the top of the mountain stands the Thai Son Pagoda, which attracts many pilgrims at full moon. Next to the mountain buried deep in the rubber plantation is Cau Nom Lake, where the combination of the clean water and fresh air create a tranquil atmosphere. I think the area around the two lakes is a great place for tourists who either want to relax after a hard days work, go camping with family and friends or try out water sports. However, despite its beauty, a shortage of basic infrastructure such as hotels, restaurants and services mean this is a day trip at most (unless you decide to camp). From Dau Tieng Lake, my friends and I walked for about 5km through the rubber plantation and reached Truc (small bamboo tree) Stream, which runs down from Mt Cau into Binh Duong Province’s Dau Tieng District. The name of the stream originates from its source further up the hill in a small bamboo forest, and my friends and I decided to try and find it. The first thing I saw were huge flat rocks that nature had arranged into stairs leading to a shelter for a giant, according to a legend told by local residents. Passing through the huge shelter was like walking through a stone maze, with millions of small stones arranged in all sorts of different shapes. One friend had the bright idea of stopping there for a picnic lunch, so we made makeshift chairs and a table out of the rocks, and spent a leisurely couple of hours enjoying the peaceful surroundings. The fresh air and cool atmosphere enhanced by the murmuring stream and twittering birds were like something out of a fairy tale. Leaving the maze, we reached the giant’s stone bed which covers an area of about 3sq.km. The ‘bed’ is covered with natural wrinkles that local residents say were made by the giant as he tossed and turned in his sleep. A beautiful staired waterfall was awaiting us ahead, where visitors, including ourselves, did not miss the chance to take photos. Den said it was a beautiful setting and it was a shame that not many people from other cities and provinces knew about it. He added that only a small number of visitors were from HCM City and other localities although the number had increased recently. Den said Truc Stream was a popular destination all year round but it was most beautiful during the sixth to tenth months of the lunar calendar. He said it was because the area had remained relatively untouched by humans that it retained its wild and natural beauty. Den also showed us one of three small ponds around the stream where he said not many people could refuse the inviting waters on a hot summers day. “Some of them even enjoy skinny dipping. It looks funny but it feels great to escape the hot weather in the cool water,” Den said and laughed. Departing the stream at sunset, my friends promised they would return soon when it was a bit quieter, to enjoy a once in a lifetime naturalist experience. Dau Tieng has a large space, natural landscape stretching along both sides of the lake that creates a natural charming and poetic picture. Small islands like Xin, Trang, Dong Bo creates new touches for visitors.